YouGov’s BrandIndex has ranked Carnival Cruise Lines the most-improved U.S. brand in consumer perception, or “buzz,” in its mid-year 2014 Buzz Rankings Report. Throughout the second half of 2013 and thus far in 2014, Carnival has initiated a number of new programs that have resonated positively in the marketplace. According to BrandIndex, Carnival’s change in consumer-perception score by mid-2014 was double the improvement level achieved by the company ranked second on the most-improved list. “Carnival not only brought its consumer perception back in line with the rest of industry, but their sales potential, indicated by consumers who say they would consider the brand for their next cruise, has rebounded above the rest of the cruise sector,” said Ted Marzilli, CEO of BrandIndex. 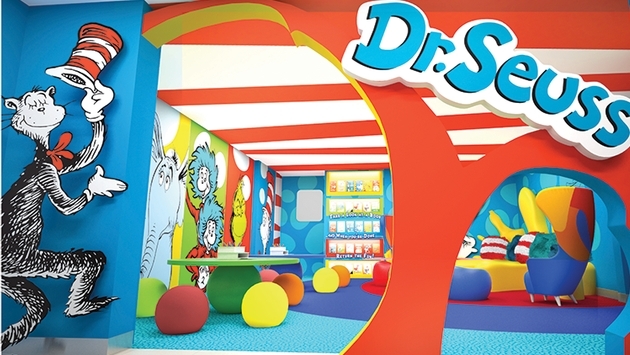 Seuss at Sea — An exclusive partnership with Dr. Seuss Enterprises that brings the beloved brand and characters on board Carnival ships, and offers a variety of exciting and immersive family experiences. Carnival LIVE — A first-of-its-kind concert series featuring exclusive on-board performances at select ports of call by a diverse roster of popular music artists including Jennifer Hudson, STYX, Chicago, Jewel, Lady Antebellum and Daughtry, among others. Shore Excursion Best Price Guarantee — Guests who find a lower price on a shore excursion offered by another operator either before or during their cruise receive 110 percent of the difference in an on-board credit. Great Vacation Guarantee — A hassle-free program that provides a 110 percent refund, complimentary transportation home and a $100 shipboard credit for a future cruise if guests are dissatisfied with their cruise for any reason within 24 hours of departure. Camp Ocean — An exciting new marine-themed children’s program that immerses children ages 2 to 11 in the wonders of the sea through more than 200 fun, engaging and educational experiences. “We have worked very hard at Carnival over the past year to bring fresh programming and innovation to our ships while maintaining consistently smooth operational performance and the results of this latest BrandIndex data is a gratifying acknowledgement of those efforts,” said Gerry Cahill, president and CEO of Carnival Cruise Lines.